Enoch was born on 24 May 1821 at Tutbury, Staffordshire, to parents Joseph and Catherine. He was baptised on 24 June 1821 at the Independent Chapel, Tutbury. Enoch had no education apart from attending Sunday School. Aged nine, his mother hired him out to an old farmer for the sum of one shilling per week and his food. After two years Enoch went to London to see if he could better himself there. After three months, he disliked London so much he resolved to leave it and go back to the provinces. An older brother who was also in London predicted he would have to work hard all the days of his life and end up in the workhouse! On leaving London, Enoch took a situation as a labourer in a brickyard at Clay Cross. It was here that through the visitation an interest of a local preacher, Enoch was brought into contact with the Primitive Methodists and subsequently converted. Soon after his conversion, stirred by the ministry of Rev. John Dickenson, Enoch was made a local preacher. In the early 1860‘s, Enoch moved to Staveley, where he found that no PM society had yet been established. Although approached by Wesleyans to join them, Enoch preached in the outdoors for nine successive Sundays and generated sufficient interest to form a new society. He then approached the Quarterly Meeting of the Bolsover Brach of the Chesterfield circuit to put the locality on the plan. Enoch went into business as a brick maker, farmer and surveyor of the highways, and was able to support both materially with bricks and through donation the erection of several chapels in the area. He laid memorial stones in connection with at least fourteen new chapels. 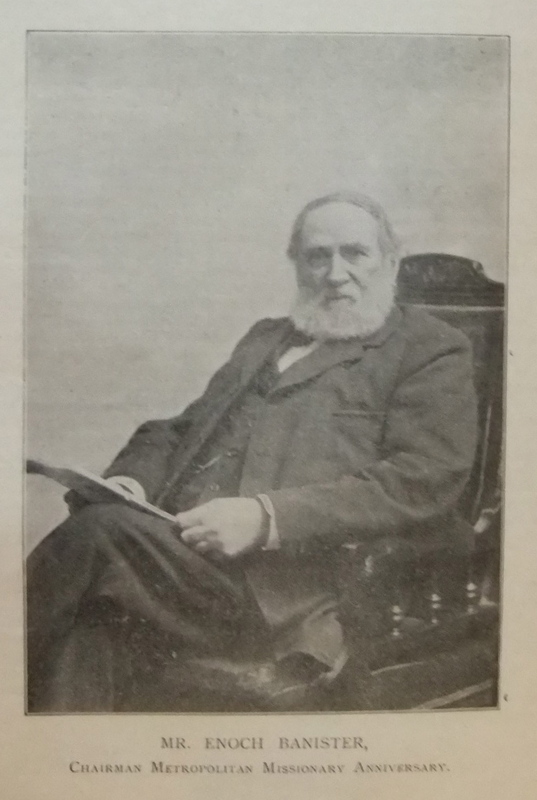 In connection with the Staveley Society, Enoch was a steward, class leader and local preacher. He was also treasurer of the Chapel Trust from its beginning. He was a member of several district committees and several times a delegate to the District Meeting and Conference. Enoch was chairman of the Metropolitan Missionary Meeting in 1900. Enoch married Emma Wheatcroft (1822-1874) on 12 August 1839 at Chesterfield. Census returns identify two children. Enoch married Helen Dudley, nee Croft (1827-1883) in late 1874 at Staveley, Derbyshire. Enoch married Sarah Ann Rodgers, nee Thornley (1836-1904) in the spring of 1884 at Chesterfield, Derbyshire. Enoch died on 22 September 1908 at Staveley, Derbyshire.